Given their American advisers, it could have been considered an Obama moment. Having captured the Indian vote and being sure of where their sensibilities lay, it was necessary to keep the normally ebullient Indians out of sight and parade the Africans on stage. 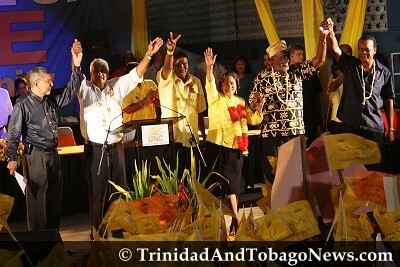 So that while the voice of labour, black power and state’s rights were paraded before the audience the real heavyweights were left for last, Kamla appropriately assuring the nation that UNC’s identity was not lost in all of this partnership talk. Unity in diversity was the slogan of the evening. Such sentiments were in keeping with the moment. It was the objective for which Tubal Uriah Butler and Adrian Rienzi had fought. Although Butler revered His Majesty, the King, and placed much faith in his benevolence, he also understood that he who performed the labor must reap its benefits. Such down-to-earth plebian sentiments seemed to be in keeping with what we should aspire to which is why one listened in horror as Mr. Manning sought to belittle Dagga and his outfit at his meeting. That is why Kamla was correct when she urged that we learn to honor our icons: they are the ones who made us who we are. Kamla saw victory at hand and reverted to British Prime Minister, Harold Macmillan’s timely phrase from his “Wind of Change” speech that he delivered when he addressed the South African Parliament in 1960 during his tour of the African Commonwealth states. In this important speech Macmillan acknowledged that black people in African were claiming the right to rule themselves in light of the tremendous surge of nationalism that had swept the continent. And, it would have been a magnificent stroke of genius if Kamla had kept on that theme and told the people why that moment, the coming together of so many political and civic groups, is so very important for Trinidad and Tobago and what it portends for our future. In fact, I make bold to say that if this flower that was planted in Fyzabad is allowed to bloom or, better yet, if those organizations who came together allow the flower to bloom or, even see the light of day, it may just be the dawning of new beginning for T&T. Instead of rising to the occasion, Kamla was platitudinous. She threw God into the equation; conceded we had lost our way; and acknowledge that “we are all gathered here to make history.” She didn’t say how we would achieve the “sustainable good governance” that her Partnership document called for. She invoked the words of our anthem that promised that “every creed and race shall find an equal place” and warned that those (meaning the PNM) who do not learn from history are likely to repeat its mistakes. It was good theatre; perhaps a necessary beginning to a partnership that may grow and develop in small steps. But, it must outline its program. They must not disrespect our people’s intelligence and sink us further into the dust. Theirs is the task to make our people realize their power and their potential in a land that promises so much but which has fallen short of its glory in many ways. If the partnership is to capture the moment, and advance the struggle that Butler, Renzi and Dr. Eric Williams bequeathed to us, then it is honor bound to honestly chart out a philosophy and program that speaks to our development. It must lift up our people’s imagination and allow them to see higher heights (Kamla says she loves Bob Marley’s lyrics); to conceptualize the practicality of racial harmony and, most of all, strive to return political power to the communities in which it belongs in the first place. This is the logical culmination of the political and social struggle that began when Dagga mutinied in St. Joseph in 1837; the same struggle that Butler and Rienzi extended; and the same one that Dr. Williams concretized in the independence movement. This new social order can arise only from our communities. Inescapably, this suggests the further decentralization of government and the removal of power from the top and returning it to the people at the bottom of the society. In the final analysis we must strive to create a system that eliminates the very status and positions of power to which the leaders of the partnership aspire. Such an ideal will take time. However, over the next thirty days we will see how the people’s partnership begins to speak to this ideal. So the dead, departed, porcine leader of the PNM, Dr. Eric Williams, ‘concretized in the independence movement,’ to, ‘strive to return political power to the communities in which it belongs in the first place,’ and yet he and the PNM conmen then and thereafter, during ALL their tenure, FAILED to do so, and MAINTAINED those very same, ‘status and positions of power’ which they occupied!!! Is this ‘we’ being referred to the code word for the African-descended, major constituent of the (ah-go-dead-ah) PNM voting mob?? “Together we aspire, Together we Achieve”. What is it that you want to do Bacon 172000? I want a reasonably assimilated society. The people who can’t come together in society need to leave the country. PEOPLE DO NOT READ THIS RACIST – This creature should be banished from the world of print – he only rears his ugly head at the time of elections or when he thinks his PNM is about to loose power – thats his only purpose – to perpetuate and spew racial venom, nothing else. Does the University that you teach in the US, know that you are a rabid racist only intent on de-stabilizing the country that gave birth to you? They should be told of your racist exploits in life. Hope we dont see you anywhere around here for this election or even after – keep your distance, please.